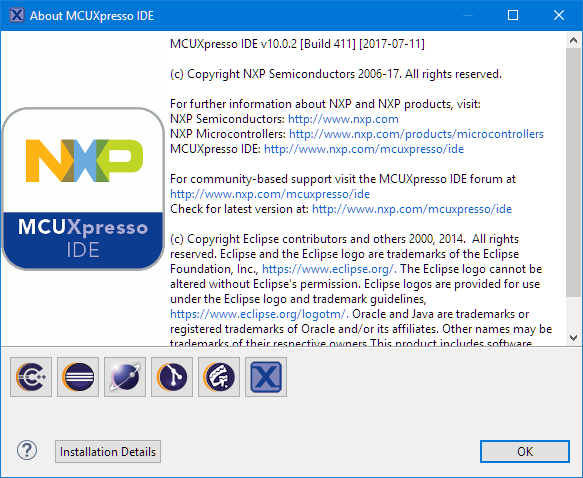 MCUXpresso is a code size unlimited, free of charge IDE (Windows, Mac and Linux) from NXP for Kinetis and LPC (ARM Cortex-M) microcontroller devices (see “MCUXpresso IDE: Unified Eclipse IDE for NXPs ARM Cortex-M Microcontrollers“). After the v10.0.0 (build 344) release back in March 2017, there is now the new release v10.0.2 (build 411) available. The release is a full setup/installer which has the advantage I can keep the 10.0.0 installed and install the 10.0.2 side-by-side. As the version number indicates, this is more of a point release and smaller update (see the release notes). Beside of the smaller changes, the new release comes with several improvements for debugging which makes it worthwhile to download, install and use it. Launching a LinkServer (e.g. using the LPC-Link2 probe) debug session now starts noticeable faster. Same for semihosting with LinkServer: this is faster too. Other major improvements are for the Segger J-Link. 💡 As noted in the release notes: with all the changes, it is advised to delete and recreate launch configurations (this is done automatically if trying to connect to the board) if moving to the new IDE version. 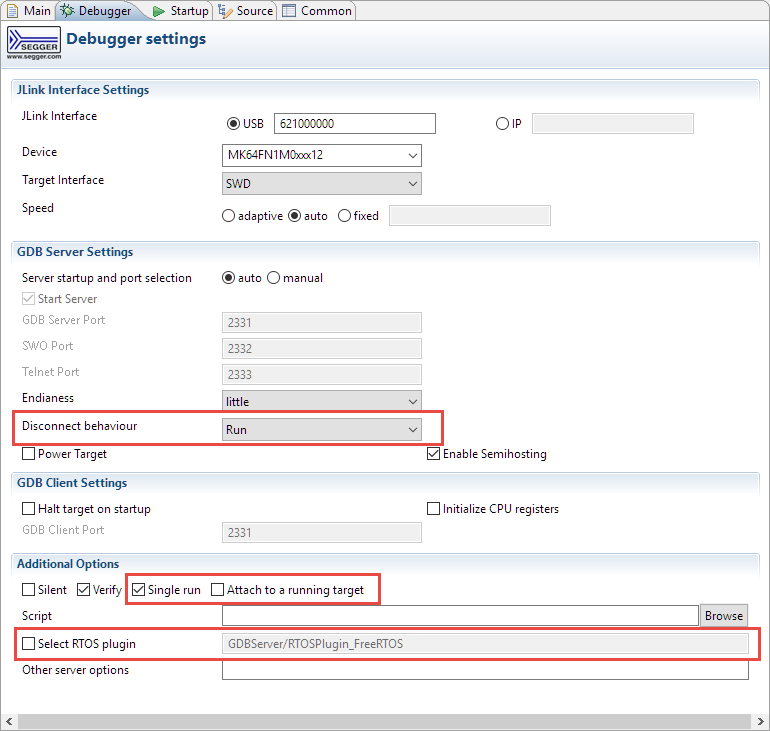 Both the P&E and Segger connections now support multiple connections to multiple probes at the same time (concurrent debugging with multiple probes). And for everyone else who has Kinetis Design Studio installed on Linux: the new IDE now solves a problem with the P&E drivers, so this alone is a good reason for me to update to the new version for my next classes. After a little more than 3 months after the first 10.0.0 release, NXP has release an update with the version 10.0.2. The new update shows that NXP is committed to their new combined IDE. 10.0 was already very solid for me. The sum of all the smaller changes and especially the extensions for debugging makes it worth the update, and I’m in the process of moving all my MCUXpresso IDE projects to the new version 10.0.2. This entry was posted in ARM, Cortex, CPU's, Debugging, Eclipse, Embedded, gcc, Kinetis, LPC, LPC, MCUXpresso, MCUXpresso IDE, NXP and tagged arm gcc, Building, Debugging, Eclipse, gnu gcc, Kinetis, LPC, LPC-Link2, MCUXpresso, MCUXpresso IDE, software project, technology, tool chains by Erich Styger. Bookmark the permalink. It’s taking me a long time to get familiar with the KE18F we want to use, but I’m impressed with the reliability of MCUxpresso. I wish it had all the features of KDS as well. I’m missing Processor Expert. What other feature are you missing? Well that extra debug file load for the open sda built in to the tower board is one (maybe that’s missing in KDS too but I only found it now). Mainly though the different library build I’ve still not figured – on KDS no problem adding my boot code into the project at library build, not sure yet how to do that. And since it generally is better / more stable, would be nice to move my KE06Z project over from KDS! I’m not sure what you mean with that ‘extra debug file load’? Can you provide details about what you mean? Something you helped me with on KDS last year; my checksum is not in the ELF only in my created SREC so checksum fails debug. You showed me to add another ELF to debug launch configuration and specify a SREC with just the checksum. Works perfectly on KDS but on MCUxpresso it’s available in P&E launcher but not in the “free” open sda one. I see. Keep in mind that P&E is available for the free OpenSDA debug interface too (https://mcuoneclipse.com/2013/12/14/new-pe-opensda-firmware-v114/). Thanks, but I think that’s reverse of what I’d want! I’d like you use the built-in-tower debug interface, but through the P&E debugger that supports additional ELF file – can’t imagine that would work. Yes, you can use the built-in tower debug interface (which is actually from P&E I think). You can load Segger, P&E or CMSIS-DAP firmware on it. Did you manage to install Eclipse Marketplace in it? I can’t and I’m not sure it’s a problem on my side or something else. yes, using http://download.eclipse.org/mpc/releases/1.5.2/ as update site. Hey Erich, Good to see NXP and Freescale finally have a common IDE. I wish they would have released there OpenSource SDK. where all necessary source code of most if not all devices is present. Also downloading source for FRDM-KL25z tool more than 15 minutes of selection not that I am complaining. I had expected it to be easy download at least after logging in. But I would like to thank them for so neat source organised in the zip file. It would be a good idea to have a walk through guild of this source code. Yes, this is a bit wish from my side too: to have everything (or at least the possibility) or multiple devices in a single SDK. I wrote about combining SDKs here: https://mcuoneclipse.com/2016/06/13/combining-multiple-nxp-kinetis-sdks-into-one/. But this recently did not work any more, it seems that every release for a device has some extensions/changes, and getting it in one directory causes a lot of risks for me. I know that there were some discussions to have everything in a public Git repository: that way it would be easy to get everything and/or to know that changes from one release to another. I wish our wish come true in near future. I am pushing my self to do everything using command line Linux. Like your timefirst blinky tutorial on FRDM-kl25z. I have compiled tool chain and tested that blinky code. To my surprise windows make file compiled code and worked when fleshed. Only problem I had with make clean. Del was not present and / & \ issue. Now moving forward to compile freertos from scratch. I had few questions. 1. Your projects are licence under which GPLv2? As David pointed out, you should use ‘rm’ instead of del. Most Windows Eclipse distributions come with a ‘rm’ too to keep make files portable between hosts. Yeah, Done that working great. Good to know it is Educational LICENCE. Hi, I’ve a doubt about the use of MCUXpresso. I installed the SDK downloaded from the MCUXpresso SDK Builder with drag and drop on apposite window, but I don’t understand how to include it on my project. I use SVN and I have all drivers needed in my project but if I compile in another PC without my SDK it return an error. You have to to install that SDK on that other PC too. I hope that this might get relaxed in a future version, but this is how I see it is working now. You would have to pull that SDK for example on that other machine too.